Google told us that the walk through the city from the seafront would take about an hour. We started amongst the fruit and flower stalls in Chiaia went past the expensive shops and on towards the heavily policed, main shopping street Via Toledo. Then across the Piazza Carita to the Via San Biagio dei Librai just up from the university. This is where Naples shakes everything it has at visitors like us who funnel across from the modern towards the old, as we squeeze down the narrow streets with their pepper-red pizza; pulcinelle; graffiti; students; scooters; restaurants; buskers; beggars; ancient facades; dark doorways; churches; and somewhere, what we’re looking for. 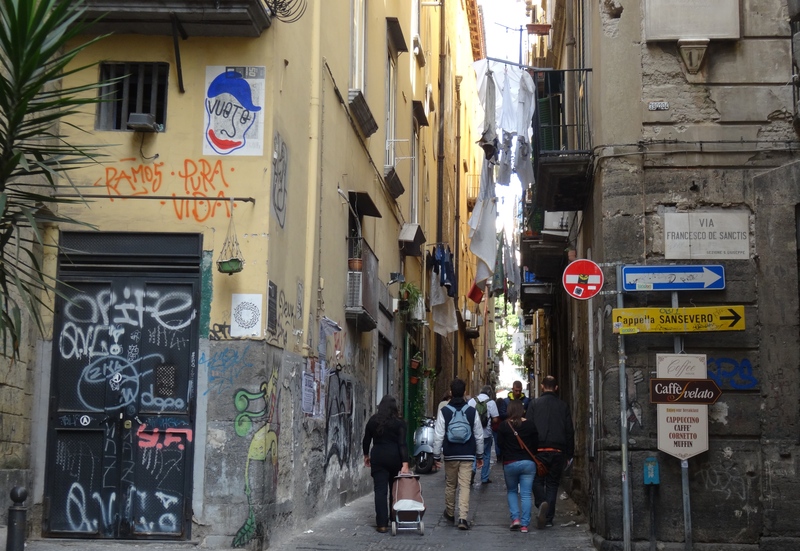 The real problem in Naples is trying to stay focused – there is so much to see. Come the end of the hour we knew we were close but the signs, even to a place as remarkable as the Sansevero Chapel, were camouflaged, hidden behind a moody indifference. Not many in Naples have the luxury of admiring old ‘art’. Finally we found it – ticket office, chapel and palazzo occupying three corners of one junction. The chapel itself looked little more than another door in from the street. Yet, just one step inside and we’d crossed to another world – a small, intense, alleluia chorus of a world. First the painted ceiling caught our eye, then the small group in the centre slowly circling the knee-high bed. On it was the life-size marble statue of the crucified Christ, down from the cross and laid out on a mattress with two tasseled cushions under his head and a veil over his face and body. The sculpture, made in 1753 and the first major commission given to the Neapolitan sculptor Giuseppe Sanmartino, looked so real it was as if the marble wasn’t there at all. It felt as though if we lifted the veil the pale body would still be warm to touch. Perhaps it was the height we had, our closeness to the face and the hands, that put breath in the stone. Around us were walls studded with beautiful, complex statues that each represented the qualities asked for by Raimondo di Sangro, the seventh Prince of Sansevero and Grand Master of the Freemasons in the Kingdom of Naples. It was he who chose the artists and who insisted on a particular layout for all the works. He was a man at the top of society in Naples, and a man whose talents and curiosity were so extreme that he seemed to alarm or annoy almost everyone. He was definitely not afraid to think way beyond the barrel with the result that the locals feared him for just about everything and the Church tried to excommunicate him. We discovered part of the reason for the alarm when we entered the underground chamber. Here our warm, Italian art glow fled, chased out by two of di Sangro’s experiments displayed behind glass – the macchine anatomiche – one male and one female skeleton threaded with mysteriously intact arteries and vivid organs. This toe-chilling ending is so much part of the mind of Raimondo di Sangro that you have to see it. As well as a lover of art he was a fervent inventor and alchemist who went on asking questions right until the end. It’s thought that it was the answer to one of his own questions that finally killed him. We left the intense, extraordinary chapel in early afternoon. Naples in late-October had closed for lunch. We sat on a bench opposite the entrance to plan our route home and were joined by a breathless couple from Japan. Did we know where the Sansevero Chapel was? “Yes,” we said, still slightly stunned by the whole experience. “Pompeii or Sansevero?” The tiny, distant islands of Japan floated across my mind. A link to a short article from the Getty Museum on the sculptor Giuseppe Sanmartino. Here is the link to the Museo Cappella Sansevero which will give you information on everything. 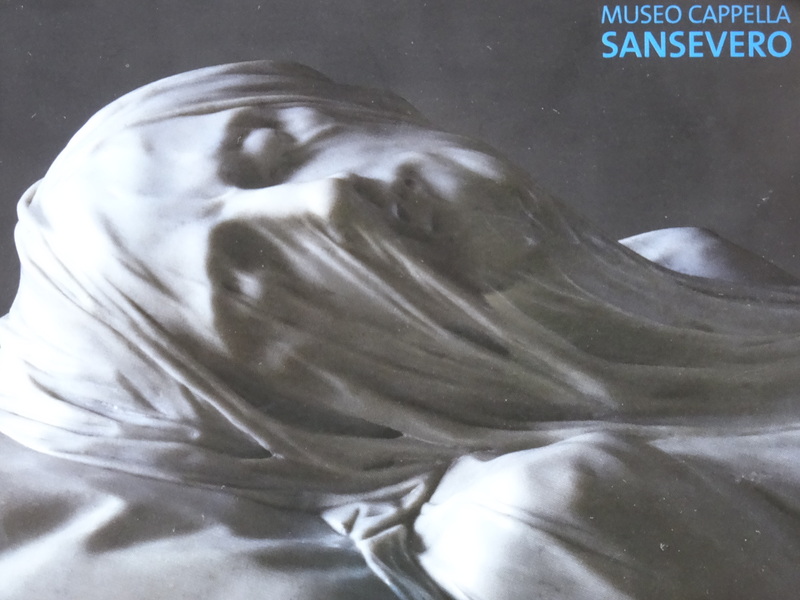 This entry was posted in Italy, Naples, Places to see in Naples and tagged Art, Capella Sansevero, Giuseppe Sanmartino, Grand Master of the Freemasons, Italy, Naples, Raimondo di Sangro, seventh Prince of Sansevero, the veiled Christ. Bookmark the permalink. Nice piece about a trip to the Centro Storico and the beautiful Cappella Sansevero. Thanks for this – just found it sitting on my site! That was my loss – many thanks. Nice piece about a wonderful chapel, a personal Naples favourite. Thanks so much for getting in touch – really means a lot to hear from someone who knows it. Hope others will get to see it.